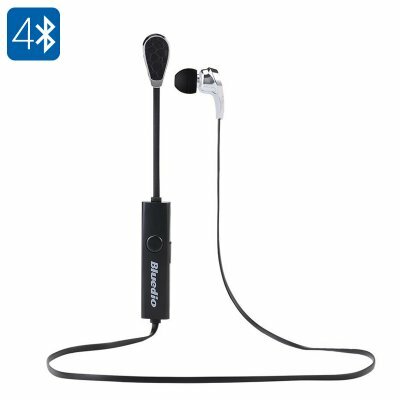 Successfully Added Bluetooth Headphones Bluedio N2 - 10mm Dynamic Drivers, Built-in Mic, Voice Command, Wind Noise Reduction, Sweat-Proof (Black) to your Shopping Cart. The Bluedio N2 Bluetooth headphones have been specifically designed to provide you with crystal clear audio while exercising. These sports headphones feature an extremely light body and custom fit design – guaranteeing long lasting comfort and allowing you to wear them throughout the day without irritating your ears. Being sweat-proof, this wireless headset can be used efficiently throughout the toughest of workout sessions without you needing to worry about its well-being. Simply pair these sports headphones with your mobile phone through Bluetooth and you’ll be all set to you enjoy your favorite tracks at any time of the day. Within its ultra sleek headphones, this Bluetooth headset packs two 10mm dynamic drivers that are capable of producing truly audiophile-grade music quality. Thanks to its wind noise reduction feature, you will be able to use these Bluetooth headphones while running or cycling without being disturbed by outside noise. A strong battery delivers up to 5 hours of continuous usage time thanks to which you’ll be able to listen to all your songs throughout the day without needing to worry about running out of juice. Featuring a built-in microphone, these Bluetooth headphones allow you to engage in hands-free phone calls. Thanks to its voice command, you can simply accept or reject incoming calls by saying ‘’Yes’’ or “No’’ out loud – bringing along high efficiency and allowing you to answer phone calls even when your hands are tied doing something else. Arguably the best Bluetooth headphones for exercise, this wireless headset lets you listen to your favorite songs in great audio quality at any given moment. Noise reduction works excellent, so as commands on mic.